Hey, friends! So, I did it. I made like a sheep and bought some Kylie Lip Kits. I swore I wouldn't do it, but something deep inside possessed me to set a 6:45am alarm and fork over some hard earned cash for two of the coveted little babies. Instagram made me do it and I'm only a little bit sorry. Poor financial decisions aside, many of you guys wanted to know my thoughts on the most wanted lip product of the moment, and so here I am justifying my purchase with a review! Please enjoy (read: humour me)! Before I begin, I'd like to make note of the fact that there seems to be some formula discrepancy amongst the various colours. As I only have two of the kits, I can only speak for the performance of these respective shades! Alright, let's do this. The colour that broke the blogger's back, and convinced me to 'invest' in these lip colours, was 22. It hypnotised me through my Instagram feed with it's gorgeous, orange-toned goodness and I was not strong enough to resist. Upon application, however, it pulled much more red than any swatches I've seen, but I'm putting this down to my skin colour and tone. I do adore the colour - so, so much! - and will be rocking this for every season, but it definitely wasn't what I was expecting. Alright, let's talk formula. The lipliner is so amazing that I'm considering creating a shrine to it in the corner of my bedroom - its that serious. If you love full coverage, creamy liners that still create edges sharp enough to cut your enemies (and who doesn't? ), this will blow your mind. I actually wore it to work with a little lip balm on top and it lasted all shift with no smudges! So impressed. The formula of the liquid lipstick is unlike any I've ever tried - and I've tried quite a few. 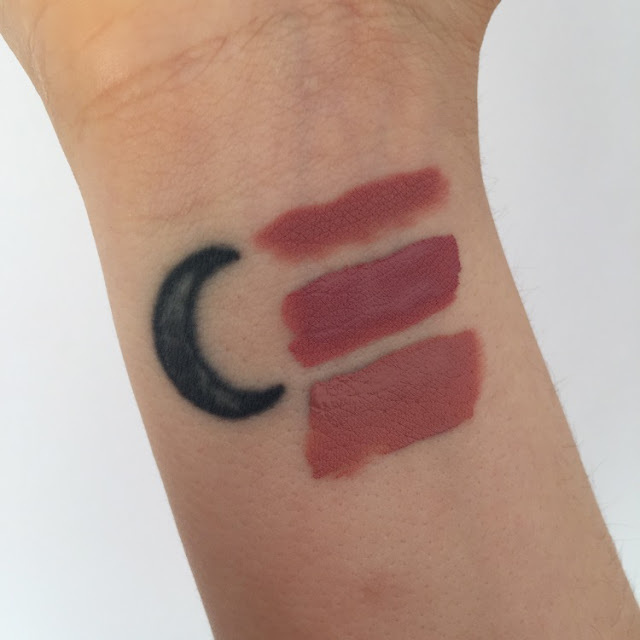 It is by far the thinnest consistency, but is still incredibly high in pigment, so there's no issues with streaking by any means. The viscosity results in a very quick dry time, and once it's set this baby is set. Several hours after application I indulged in a burger, and only some fading from the inner rim of my lips - but in a subtle, gradual way that does not emulate the manky harsh line created by other liquid lipsticks. I honestly didn't even need to touch it up, and as a lazy person I appreciate that. While you can definitely tell that you're wearing a matte lip, I wouldn't say that it is unpleasant to wear by any means - however, I did find it a lot drier than Koko K, which we'll dive into now. Damn, look at that segue. As a lover of pinky nudes, Koko K was destined to be a part of my collection, and oh boy am I glad to have it in my greedy paws. From the swatches I saw online, I imagined this shade to be very similar to Anastasia Beverly Hills' Pure Hollywood - otherwise known as my favourite lip colour of all time - and thus I was almost inappropriately excited to compare the two. They're both equally gorgeous, although Koko has more of a purple undertone, as opposed to PH's peach base. I can tell that I'm going to get a lot of wear from this baby, get prepared for all of the Instagram spam. Formula-wise, the lipliner is as wonderful as that of 22 (very). I'm mildly concerned that I'll have a moment of weakness and buy every shade of these damn kits for the liners alone. As I mentioned earlier, this lipstick is slightly more comfortable to wear than 22, although it definitely has a powder-like finish. Personally, I really enjoyed this, but I can tell this would irritate some people's pouts. The longevity and burger-resisting power was also amazing - no complaints here! Ok, now let's talk price. These bad boys retail for $29US (approx AUD$38), and shipping comes at a flat rate of $14.95US (approx AUD$20), placing them firmly in the 'high-end' cosmetic category. At first I gawked at the price, but after breaking it down I realised that you are essentially buying a liner and lipstick for the same price as a MAC lipstick - by Australian pricing, anyway - and this suddenly didn't seem quite so horrendous. The shipping is definitely spendy, but it did ship internationally in under a week. I only wish they had a less expensive option for those willing to wait - otherwise known as stingy people, otherwise known as me. I hope my little review was helpful for you, and if I just enabled your irresponsible spending then I apologise in advance!